PS: I meant to post this review ages ago but I have been crazy crazy busy with my PhD. I hope to also post a review of the upcoming record from Paris Records – The Kentucky Derby is Decadent and Depraved and also report on the trip of a wayward American in South America. Stay tuned! This book was very interesting in which we see Thompson trying to maintain a long-distance relationship with a woman other than his wife. Ms. Harrell writes that at the time she was lead to believe by others that HST and his wife Sandy had an open relationship (this wasn’t so). 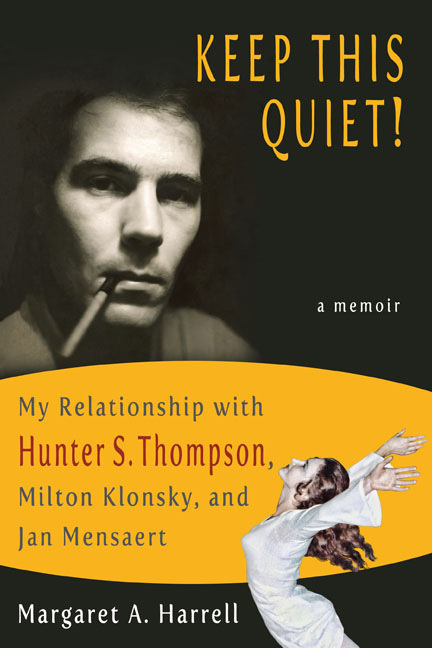 Regardless, we DO see a side of Thompson that gives even more depth to behind-the-scenes circumstances in HST’s life; like how the effect of Sandy having tragically one of her miscarriages with Thompson (not sure if it was the stillborn baby or not) had on his life, not to mention his wife’s! Ms. Harrell wisely did not rely solely on Thompson for company. She had long relationships with an established New York writer and an unrattling artist from Europe. So, good portions of the book are dedicated to these men as well. My main complaint with the book was, even though Ms. Harrell magnificently edited HST’s ‘Hells Angels’, maybe a third of the way into her book I found many punctuation errors, nonsensical sentences, spelling errors, etc., here and there. Maybe I had a bad edition, or maybe these days editors aren’t as careful as they used to be in Ms. Harrell’s day. Overall, a good book, interesting for some new looks at HST, but not great. It is definitely different to the other books out there. I think the fact that it shows another side to Hunter is valuable. I think there is room for more books that explore the man and don’t get consumed with the myth and endless “Hunter stories”. I assumed that this wasn’t on Kindle, and therefore put it further down my “to read” list. But it is on Kindle! So I’ll buy a copy tomorrow. Cheers for the late review otherwise I would’ve kept putting it off. Cool review Rory. Very perceptive. I’m a bit late getting to read it but hey. Better late etc etc..
Hi, thanks for all the comments. I’m afraid I write rather idiosyncratically. Sometimes for reading aloud. So of course, I don’t want spelling errors. But punctuation oddities are probably intentional. Sentence fragments or whatever. And the “nonsensical sentences” probably made sense to me but are always risky. I do take risks. When a writer, such as Richard Farina, had odd punctuation, so long as it was in his style and did not make reading difficult, I let him push boundaries. My approach to nonfiction is inside a fiction framework. So I do break rules. Again, thanks for the feedback. I’ll be watching for such types of errors in the future. But when it comes down to it, and I feel a sentence a certain way, and I know the correct grammar, I still sometimes believe the offbeat sentence is more effective in communicating the sense. But I do take it seriously that it might not go down well with every reader. And I definitely appreciate the comments. In fact, you’ve made me want to go back and check for errors in this book! Thanks, Rory, for such a marvelous example of a good writer, as always.